As fun as this weekend was, it was nice to be back to my normal food routine today starting with a green monster smoothie for breakfast, a loaded salad for lunch and a lazy dinner of spaghetti squash and edamame. I know, but I was feeling a little burned out when I got home from work and ready for some simple flavors and whole foods after so much indulgent eating over the weekend! Anyway, where was I? Oh yeah, the Saturday night gala dinner – the final formal evening of the Foodbuzz blogger festival. After a long day of learning and tasting, I was happy to get some relax time back at our hotel before dressing up and heading to the dinner, it was actually tough motivating myself out of the warm, comfy hotel room to venture out into the chilly wind and rain. But I did and was greeted with fries. 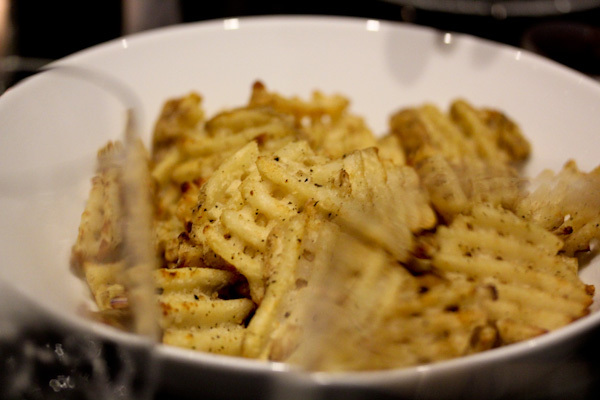 Lots and lots of fries! 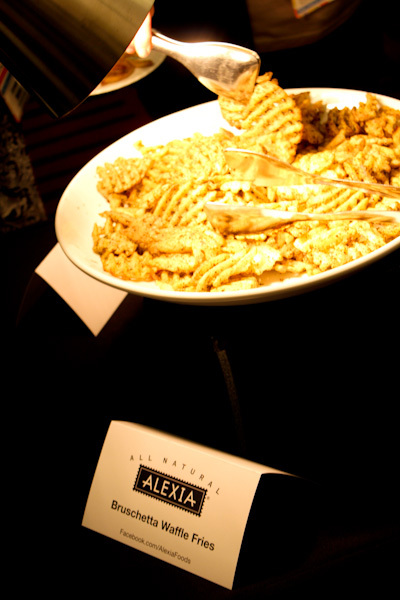 Alexia Foods sponsored the event, so we were treated to many types of fries to sample with cocktails before heading into the main dining area. 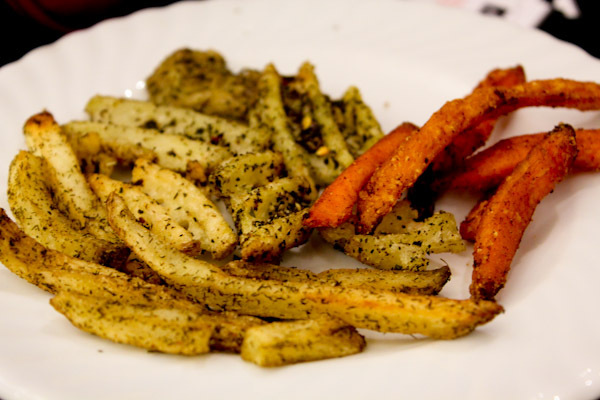 And I sampled many of them – dill, Thai spiced, sweet potato, etc. I was starting to feel like a one giant frie. 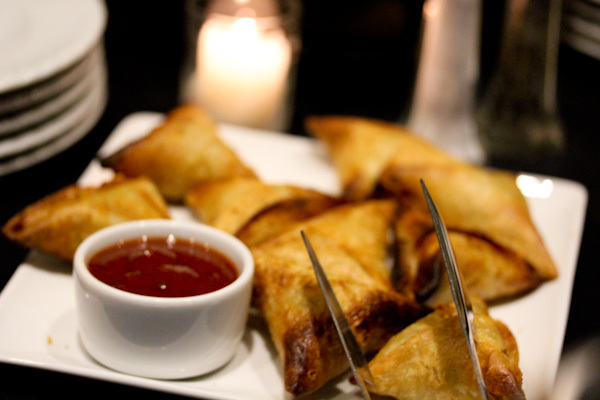 There were other appetizers at the table once we were seated, like vegetable samosas that were very tasty in a spicy dipping sauce. 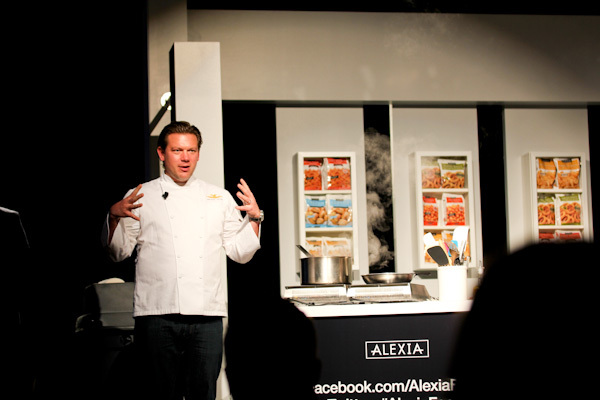 Which were served during the big event of the evening – a cooking demo by Tyler Florence. 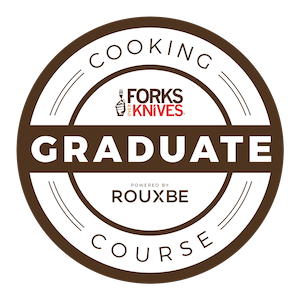 Even though he prepared pork chops which weren’t my thing at all, I enjoyed watching him in action and listening to his small talk and stories to keep the audience engaged during food prep and cook times. He’s a lively, energetic, and entertaining force in the kitchen. What I did get tired of was seeing huge, jumbo-tron shots of raw pork while he was preparing it. And the finished plate had a piece of pork on it large enough on it to serve a family of six I think! 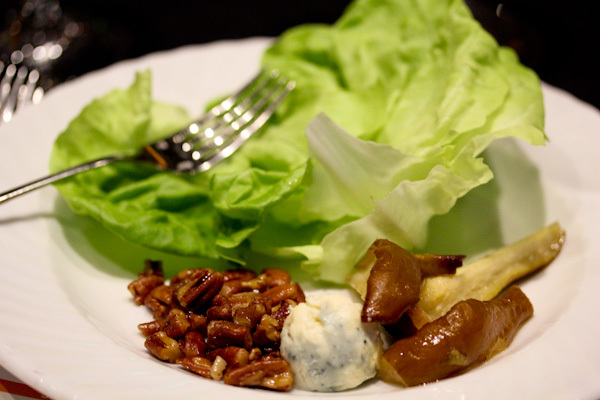 The first course of the meal was a simple dish of marinated mushrooms and walnuts in a lettuce wrap dressed with a tangy vinegar dressing which was delightful without the cheese. Last year the gala dinner had impressive separate vegan courses. That wasn’t the case this year unfortunately and despite the little V sticker on my badge, I still had to remind the server I requested a vegan meal when he tried to put the steak and shrimp dish in front of me. 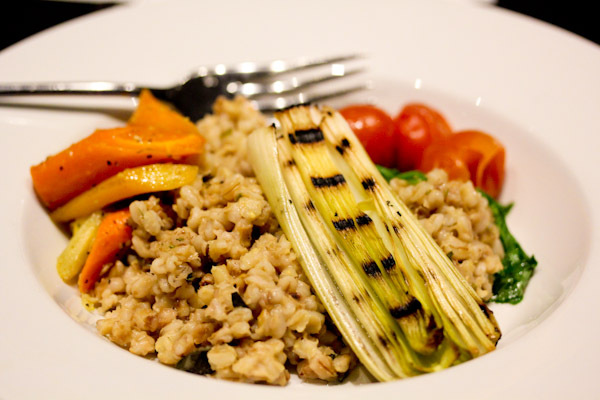 About 5 minutes later, this is what I got for the vegan main course – grilled leeks and seasoned veggies over barley which was wonderful and pleasantly light after such heavy appetizers, but nothing like last year’s menu. It seemed hardly ground-breaking or original. 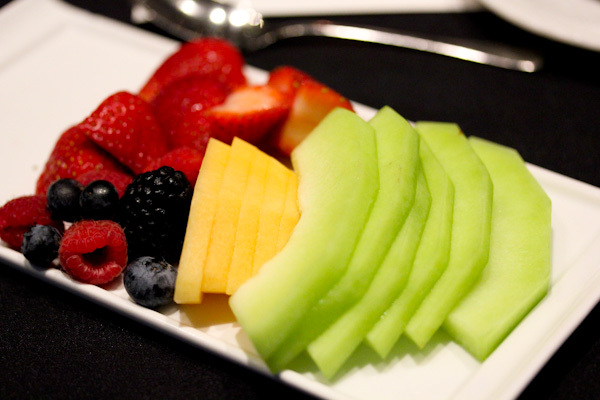 Dessert was even less original – a plate of chopped fresh fruit. Again, I had to remind the server that I requested the vegan menu when he tried to place the cheesecake dessert plate in front of me. 10 minutes later, I got this. It took even longer for another frustrated vegan diner at our table to get her dessert. So basically there was no vegan dessert planned and this was a last minute throw together for the few requests, very disappointing compared to last year. On one hand I was grateful for a lighter finish after such heavy eating, but the lack of creativity and new flavor adventure was a let down. The night was still a wonderful time chatting with other bloggers, snapping pics, swapping cards, and enjoying the open bar. And despite this menu let down, there was still a lot of vegan options at the festival this year with more appetizer options and it seemed like more sample options in the tasting pavilion. But with veganism gaining more popularity, I hope Foodbuzz makes more vegan main dishes available for the next festival. Sorry that you basically were an after thought. Ugh that is so frustrating and not right! I would have been really bummed. You have a great attitude, Christine, but seriously you are more gracious than most would have been. 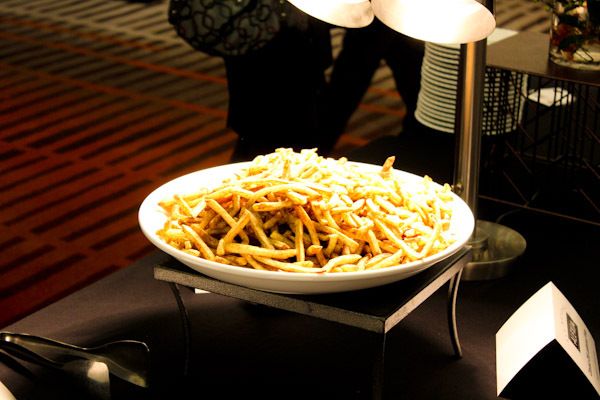 At least there were plenty of fries :) And the butternut risotto bites and samosas look good. I would have liked to see Tyler in action, too. Just to watch him work the food, the crowd, and hold it together while cooking in front of hundreds of people. That’s an art to pull off! Oh wow, I didn’t even get the chopped fruit. And it took over 30 minutes to get my barley. It’s too bad I didn’t get a chance to meet you! I’m just a vegetarian but eat vegan so the food was kind of important to me ;) I’m in San Mateo and heard that there is a new vegan shop in Sac, so maybe I’ll head up some weekend! Wow, so sorry on the barely, they took forever for a girl at our table too. It was a bummer after such a great vegan menu last year, I hope they fix that next year! 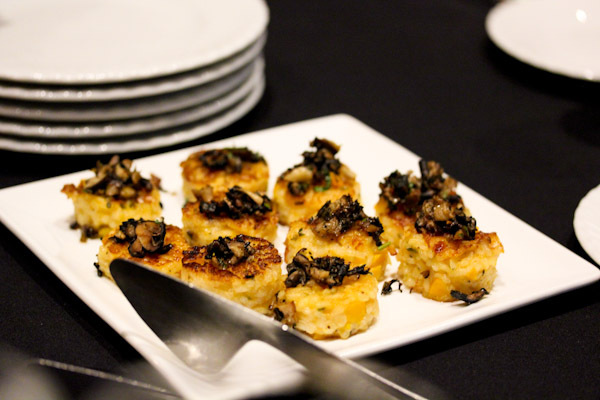 We should have a blogger meet up soon for northern California vegetarian and vegan bloggers. :-) The vegan shop in Sac is cute, but the I love going for the restaurant it’s above, yum! Wow, what a bummer! The fruit looks yummy, but I would have been disappointed with that as a dessert at a fancy dinner. It was nice meeting you at the dinner Saturday night and having dinner with you. I agree I was disappointed at the dinner you were served, it did lack any imagination. I was looking forward to seeing what they had created as a vegan option. Though I’m not vegan/vegetarian I’m finding your blog totally interesting and informative.